Across a noisy room your child signs I love you! Happy Baby Signs will be expanding this program to more Bay Area cities soon. 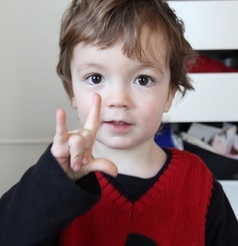 To be notified of upcoming toddler & preschooler sign language classes in your area please click the "Join Our Mailing List" link below and follow the prompts. Alternately you may click the "Update Profile" link at the bottom of our newsletters. We do not spam or share your information and it’s easy to unsubscribe at any time. Our VaVoom Series and KaBoom Series take Happy Baby Signs' Boom and Zoom Baby Sign Language Playgroups to a new level - just for toddlers and preschoolers! Your child will have a blast learning American Sign Language (ASL) with singing, dancing, story time, and action-packed games. There are two series, each consisting of eight fun-filled themed sessions. It doesn't matter which series you take first. Themes and class times are subject to change. When you're enrolled in a VaVoom series, your instructor will provide you with a password to enter this page so you can download your VaVoom handbooks for free. Signing with your baby is a wonderful way to deepen the bond between you and your child and jump start his or her verbal skills. But are there benefits to signing with toddlers after they become verbal? The answer is, "Yes!" 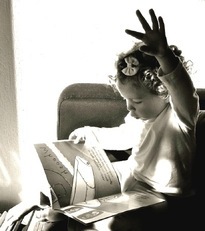 Sign language can help the older child in many ways, including reducing his frustration, increasing the tools your daughter has "on hand" when she's learning to read, and creating a bilingual bridge, among others. Read more about signing with your older child by going here. Kids like to move! Let's use that to our advantage. Sign Language channels that energy into kinesthetic learning! Kyla "feels the word" when she signs AIRPLANE. Host Your Own Class to Earn a Free Registration! *Minimum class size may be larger for certain areas.